Don't limit yourself to pickling just cucumbers — any of your favorite (or most plentiful) vegetables are prime for pickling — cauliflower, okra, asparagus, summer squash, carrots, to name a few — just keep in mind, thinner-skinned produce like cucumbers, zucchini, and corn work best. Learn more about How to Make Quick Pickles here. 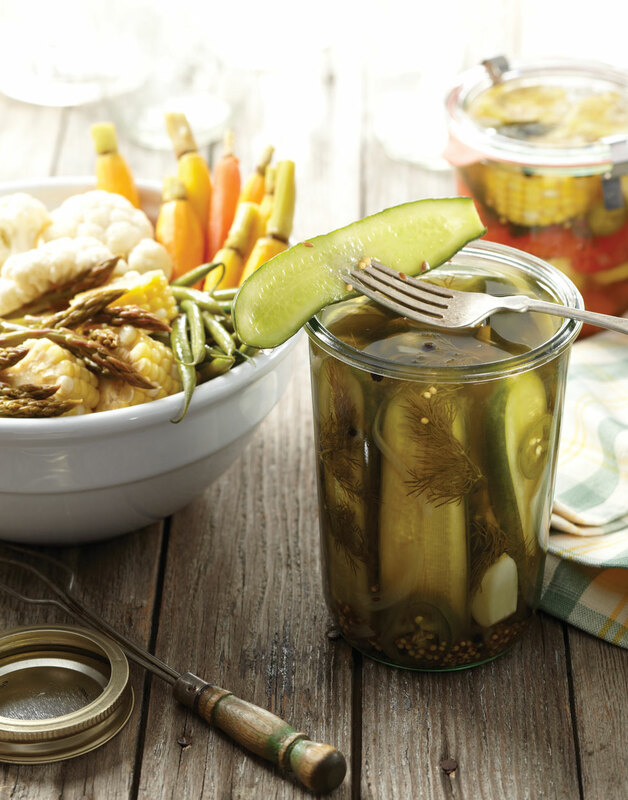 PICKLE PERKS: Besides eating pickles straight from the jar as a snack, serve them as a first course or appetizer at your next dinner party, as condiments with charcuterie or meat trays, or along with sandwiches. Don’t toss the pickling liquid once the pickles are eaten, though. Save it to use in vinaigrettes or for poaching fish or seafood. Sprinkle kosher or pickling salt over cucumbers in a colander; set aside to let drain 20–30 minutes. Rinse salt from cucumbers and blot dry with paper towels; tightly pack in a clean jar, crock, or glass bowl with dill sprigs and jalapeño. Boil water, vinegar, onion, garlic, 4 tsp. salt, dill seeds, peppercorns, and mustard seeds in a medium nonreactive saucepan, 5 minutes. Pour mixture over cucumbers; let cool to room temperature. Cover container and chill until cold. Refrigerate pickles up to 1 month. Sprinkling salt over cucumbers draws out natural liquids, allowing more pickling flavor to soak in. There may be leftover brine once the cucumbers are covered, but the pickles will still be flavorful.